Dunes are familiar features on Earth and they also occur on Mars, Venus, and Saturn's moon, Titan. What all these bodies have in common is an atmosphere, plus substantial amounts of loose sand-size particles. Of all the extraterrestrial dunes scientists know about, those on Mars are the most closely studied. A dune is a heap of sand piled up and shaped by the wind. (Underwater dunes exist on Earth, but we can ignore these in regard to today's Mars.) The word "dune" implies a substantial size — at least several meters (yards) high. But small ripples of sand only a few centimeters (inches) high are made in the same way from the same materials. The difference lies mainly in the supply of particles and how much time the wind has had to work on them. Sand grains range in size from 0.0625 mm to 2 mm. Sand forms when the wind picks up small particles of rock and flings them against other rocks and outcrops, chipping away small, sharp-edged bits. The wind grinds these pieces against each other, making them smaller and rounder through abrasion. Stand barelegged on a beach on a day with strong winds. The sting of flying sand shows you the power of windblown particles, which can break down even the toughest rocks given enough time. The process never quits as long as the wind is blowing. Sand's mineral composition depends on its parent rocks. On Earth, where granitic rocks are common, most sand is quartz, or silicon dioxide (SiO2). On Mars scientists still have much to learn about Martian sands and their compositions. The most common rock on Mars is volcanic basalt, a dark rock, so sand particles made from it will appear dark. (Some beaches on Earth are made of dark volcanic sand.) 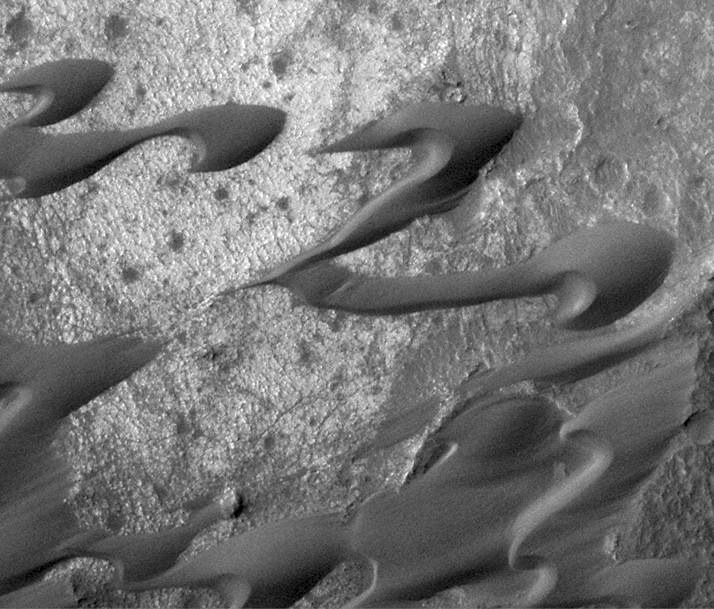 Yet many Mars dunes are not dark in tone. Scientists interpret this to mean that light-tone dust has fallen from the atmosphere to cover the dunes. 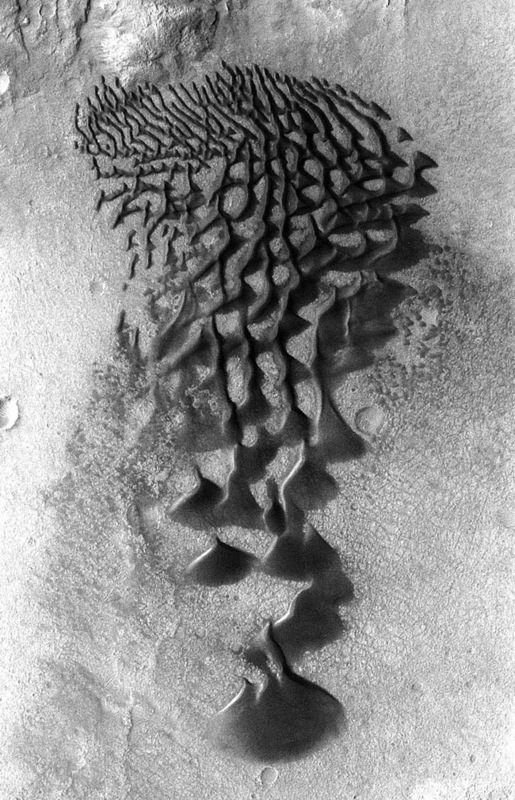 A dust coating suggests that the dune sand is not moving or active. In contrast, a line of dunes lying between where Mars rover Curiosity landed and Mt. Sharp appears dark in tone. A series of high-resolution images have shown scientists that sand ripples on the dunes are moving southwest as local winds blow from the northeast. On Earth, dunes form in numerous characteristic shapes, many also occurring on Mars. The main Martian dune types are megaripples, parabolic or barchan (bar-kan), transverse, and star. As wind blows sand, the grains slide, hop (saltate), and bounce across the surface. If sand grains are plentiful, they begin to collect in small mounds and drifts, creating dunes. A dune typically has a gentle slope (5° to 15°) leading up to a ridge or crest, then a steeper (30° to 35°) slope downward. The gentle rise is called the stoss or windward face, while over the crest lies the slip face or lee face. With a steady wind blowing from one direction, a dune migrates downwind. Sand grains bounce up the stoss slope, cross the crest, and avalanche down on the slip face. As more grains arrive on the slip face they bury the earlier-arriving ones. Slowly, the dune crest moves downwind, and eventually the first grains emerge on the windward face once more. They get picked up and blown over the crest and onto the slip face again, and the process repeats endlessly. This simplified picture has many variations. Dune shapes vary according to sand supply, the ground they move across, and wind directions. For example, winds that blow in two opposite directions (from day to day, or throughout the year) create sharp-crested dunes with roughly equal slopes on either side of the crest. Star dunes, which show several crest lines that meet, form wherever winds blow from several directions about equally. Moreover, dunes do not remain fixed in type. 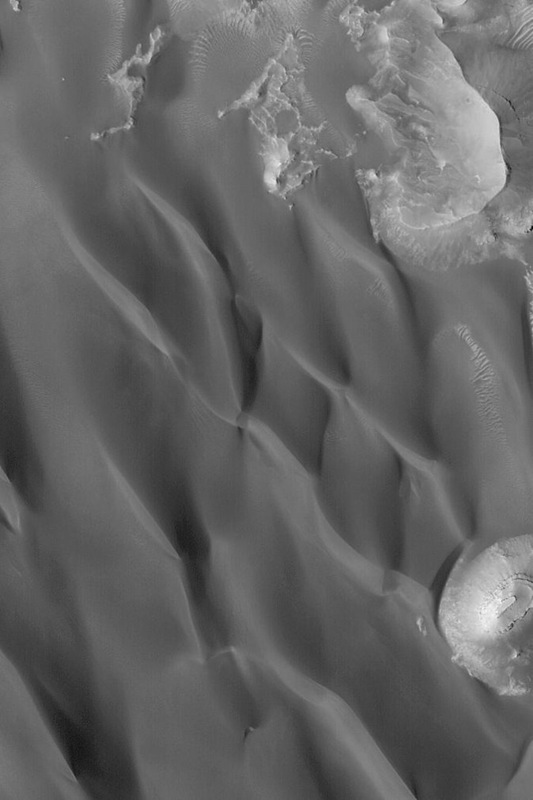 Barchan dunes, for instance, can merge into barchanoid ridges, or the "horn" on one side of a barchan may grow steadily longer until it becomes a transverse dune. And so on. As you study dunes, remember that every dune is the result of constructive forces and destructive ones. One force breaks rocks down into grains, and another force pushes the grains together to build dunes. This cycle of building up, tearing down, and building again is a fundamental process in all geology and earth science. Whenever you look at a landscape, either an image or in real life, try to figure out what's being built and what's being destroyed in what you see.